Never worry about missing out on an e-mail from your customer. 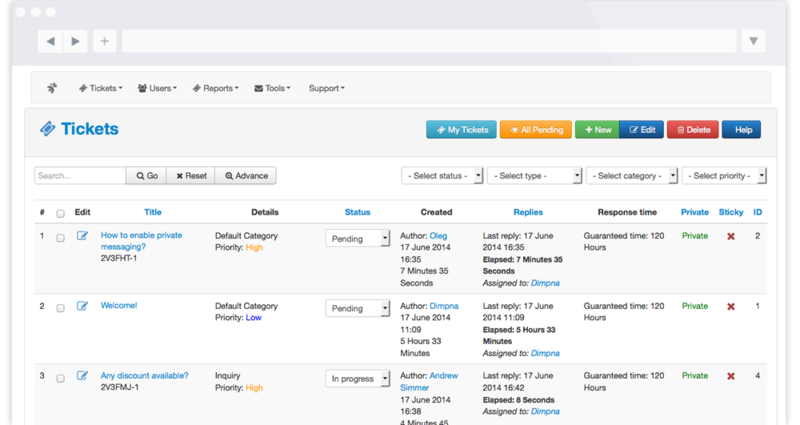 Manage inbound inquiries, track and respond to customers' requests easily and quickly. Give your customers the quality support they expect from you. Every time. Create private or public support tickets and even forum like, giving you the ability to directly engage with your community and allow certain customers to view a specific ticket. Never worry about missing out on an e-mail from your customer. Each and every email is automatically converted into a ticket that is assigned to a support agent. Each time a ticket is created an automatic notification will be sent to the assigned support agents and to the customer. Even better, you can customize your own personalize notifications. Sometimes you need to support a Spanish client. Some other times, you need to help a Chinese user. With jTickets, you can easily translate each views and email notifications into different languages. Every incoming ticket gets automatically prioritized and assigned to the right support moderator. Even better, easily assign a ticket to a qualified support agent to be sure the customer gets the best service. With customizable ticket fields, jTickets let you give each customer a support experience tailored just for them and gather better information that you need so can resolve tickets fast and efficient.